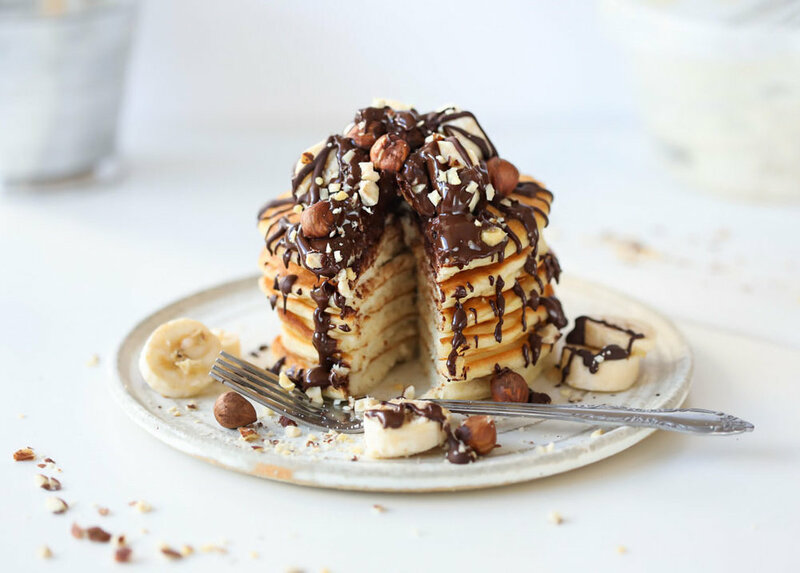 The best kind of Monday is one that starts with extra fluffy pancakes topped with bananas, nuts and lots and lots of chocolate! I always start by deciding how I want to shoot the recipe and then set up the camera for the angle I think is best for this specific food before I start cooking. In this case, I set up my camera, and then went ahead and made the pancakes. Once I added the pancakes, I wasn't very convinced with my framing, so I went ahead and got a little closer to fill the frame with pancakes. I normally start with less and then add more interest to my scene, before I do the final touches to my food. Let's get a little closer...isn't this just delicious! Once I am happy with the shot, I like to try different angles and play a little more with the food, for instance, I cut the pancakes and changed my angle and got this shot which turned out to be one of my favourites! Being prepared and having an idea of how you want to photograph your food saves you a lot of time on set, that being said, don't just take that one shot you had in mind, take it a step further, get in close or step away, move things around and make sure you get the most out of your setup! As always, feel free to connect with me, leave me a comment with your questions and I'll see you next week in a brand new edition of #AskMahaMonday!